Boat Trailer Guides | Boat Trailer Post Guide-Ons | VE-VE Inc. NOTE: These Post Guide-Ons are QUALITY AMERICAN MADE Products, and you DO get what you pay for! NOTE: We now have "POST GUIDE PADS" with PREMIUM, AMERICAN MADE, QUALITY. Scroll down on this page to see them!! ALSO "PIPE LIGHTS" on Page #2. Boat Trailer Post Guide-Ons, T-945; 47" tall, 1 PAIR (1 ea. shown). Gold Zinc Plated finish model, for FRESH WATER USE. ( Choose T-945-G, for SALT WATER USE! ). Use on boat trailers or boat lifts/hoist. 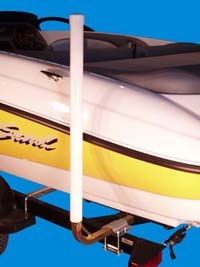 14 ga. steel tube, NOT lighter 16 ga.
Boat Trailer Post Guide-Ons, T-965; 65" tall, 1 PAIR (1 ea. shown). Gold Zinc Plated finish model, for FRESH WATER USE. ( Choose T-965-G, for SALT WATER USE! ). Use on boat trailers or boat lifts/hoist. THIS ITEM IS OUT OF STOCK UNTIL 4/29/19, BUT STILL TAKING ORDERES!! SORRY!! Boat Trailer Post Guide-Ons, T-965-G; 65" tall, 1 PAIR (1 ea. shown). Galvanized finish model, for SALT WATER USE! ( NOTE: GOLD ZINC PLATED MODEL SHOWN. ) Use on boat trailers or boat lifts/hoist. Boat Trailer Post Guide-Ons,T-967-G; "HEAVY DUTY" 7-1/2 ft. Tall, are ideal for those larger boats that are to big for any standard Guide-On, on the market. 2-1/2" PVC Tube with 2-1/2" sq. trailer mount tube. NOTE: To help explain how HEAVY DUTY the T-967-G; "7-1/2' Post Guides" are, they weigh 110 lbs. a pair! Click on "DETAILS" for product Info. & pictures that better show how BIG they actually are!! PONTOON TRAILER, Post Guide-Ons, 22" Tall, mount to trailer frame cross member and mounted to inside of boats pontoons. NOTE: Click on details for product Info. and picture mounted on trailer. Boat Lift, Post Guide-Ons, adjust from 66" to 78" Tall and mount to boat lifts, lift carriage frame cross member. ( STRAIGHT FRAME or V FRAME, lift carriage frame cross members ). Keeps boat centered while raising boat lift’s, lift carriage. NOTE: Click on details for product Info. and more detailed pictures. Post Guide Pads ( 36" long, for T-945 & T-945-G ) protect boat's gelcoat from contact with PVC tube on Post Guides. Pads are made of Heavy-Duty 600-denier canvis type material, wrapped around a 1/2" thick foam padding for extra protection. This model has open ends with sewn-in elastic bands FOR POST GUIDE-ONS WITH LIGHTS. Click on "DETAILS" for more product Info. 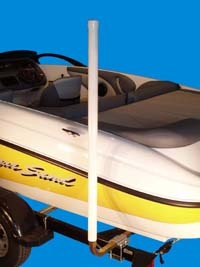 Post Guide Pads ( 36" long, for T-945 & T-945-G ) protect boat's gelcoat from contact with PVC tube on Post Guides. Pads are made of Heavy-Duty 600-denier canvis type material, wrapped around a 1/2" thick foam padding for extra protection. This model has a capped top end with sewn-in elastic band on bottom open end. Post Guide Pads ( 48" long, for T-965 & T-965-G, & cover 48" of the 60" PVC Tube ) protect boat's gelcoat from contact with PVC tube on Post Guides. Pads are made of Heavy-Duty 600-denier canvis type material, wrapped around a 1/2" thick foam padding for extra protection. This model has open ends with sewn-in elastic bands FOR POST GUIDE-ONS WITH LIGHTS. ( NOTE: These are NOT for the T-945 & T-945-G Post Guides. These pads are 8" longer then there 40" PVC tubes and will not slide past the welded brace on the steel tube !! ). Post Guide Pads ( 48" long, for T-965 & T-965-G, & cover 48" of the 60" PVC Tube ) protect boat's gelcoat from contact with PVC tube on Post Guides. Pads are made of Heavy-Duty 600-denier canvis type material, wrapped around a 1/2" thick foam padding for extra protection. This model has a capped top end with sewn-in elastic band on bottom open end. ( NOTE: These are NOT for the T-945 & T-945-G Post Guides. These pads are 8" longer then there 40" PVC tubes and will not slide past the welded brace on the steel tube !! ). Post Guide Pads ( 48" long, for T-965 & T-965-G & COVER the FULL length of the 60" PVC Tube ) protect boat's gelcoat from contact with PVC tube on Post Guides. Pads are made of Heavy-Duty 600-denier canvis type material, wrapped around a 1/2" thick foam padding for extra protection. This model has a capped top end with sewn-in elastic band on bottom open end. ( NOTE: These are NOT for the T-945 & T-945-G Post Guides. These pads are 8" longer then there 40" PVC tubes and will not slide past the welded brace on the steel tube !! ). Pipe-Light Kit, T-1018; 1 Pair of INCANDESCENT Lights. Molded PVC housings W/ submersible 12 volt Lights mount onto existing 2" PVC trailer Post Guide-on's. ( Stop, Tail, Turn functions ). Kit contains 1 pair of Pipe-Lights with 10' wire leads and wire conn. for easy instal. SOLD AS PAIRS. NOTE: IMPORTANT! Click on DETAILS for more INFO.